Scientists from Ukraine, Azerbaijan, Georgia, Great Britain, Poland and Belarus take part in the International scientific conference “Achievements and prospects of the development of microbiology”, which began on October 12, 2016 in Lviv national University named after Ivan Franko and continued for three days. The conference participants were welcomed by the Dean of the Biological Faculty Ihor Hamar and Chairperson of the Department of Microbiology, the professor Svitlana Hnatush. 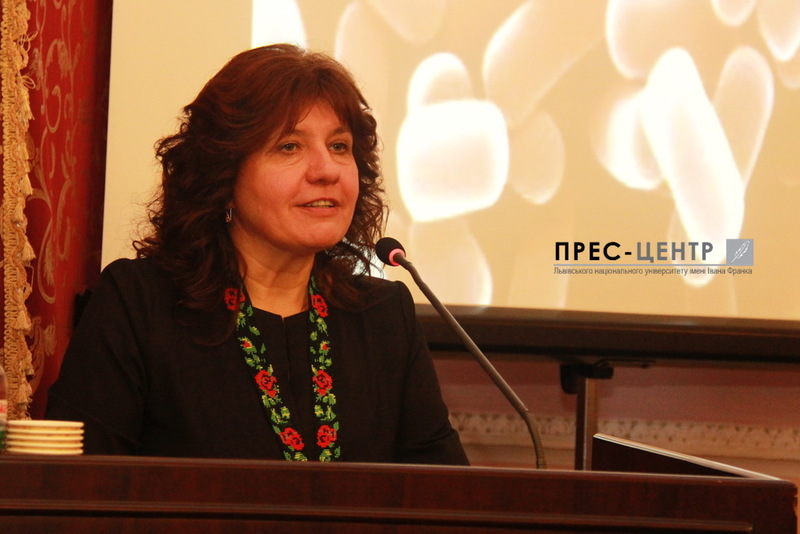 Svitlana Oleksiivna drew attention to the development of Microbiology in Lviv University, because this year the Department of Microbiology of the Biology Faculty celebrates its 80th anniversary since the establishment. “Research in the field of Microbiology began long before the creation of the department – said Svitlana Hnatush. – The first scientists who studied this issue in Lviv University were Professor Franciszek Dionizy Kamienskyi (1851-1912). He studied parasites of plants, in particular disease of grapes, he first discovered the coexistence of fungi with higher plants – mycorrhiza, and designed a microscope with a movable table for stereoscopic photography». In the speech, the professor mentioned about the successors of Franciszek Kamienskyi – Pavel Ludwig Kucher, the couple Josef and Helena Kshemyenyevskyh, Dzislava Carol Shtoyzinga and other famous scientists who pioneered the origins and the establishment of Microbiology. Professor Svitlana Hnatush spoke about the current state of the Department of Microbiology, successfully developing and expanding areas of research. “Today scientific directions of the Department of Microbiology are multidirectional. Employees are actively conducting research works with microorganisms in the circulation of compounds of sulfur, the impact of heavy metals on the physiological and biochemical properties of bacteria, develop methods of detoxification of hydrogen sulphide and extraction of heavy metal compounds”, – said Svitlana Hnatush and added that each year the graduates of the Department apply their knowledge in industry, in diagnostic laboratories and research institutions. In the circle of scientific interests of the participants of the conference are the achievements and prospects of the design of microorganisms – producers of bioethanol; biological diversity of water bacteria and soil of the Black Sea; genetic control of antibiotic biosynthesis in actinobacteria; the influence of heavy metal ions on microorganisms, which ensure the circulation of sulfur in nature. In addition, scientists-biologists discuss the toxicity and baremetal of chrome by microorganisms, studies of microbial pathogens in the virtual laboratory, as well as modern aspects of persistence Corynebacterium diphtheria. Microbiologists also emphasized on the microorganisms – producers of silver nanoparticles and polisaharid actinomycetes. Known Slavic, popularizer of Ukrainian studies in Europe and the world, Professor of University of Vienna Alois Woldan become Doctor Honoris Causa of Lviv University.